Susan here: How do you best tell the history of a town and all its people? We asked Bob Townsend how the Atlantic City Historical Society did it. I perused Family Stories, Riverton, Wyoming, 1906-1981 in Riverton’s library. I recognized about half the folks in my childhood hometown’s 75th anniversary book. The publisher – the Riverton Senior Citizens Center – apparently distributed a questionnaire (e.g., When did you arrive in Riverton? Where did you come from? What did you do for a living? Do you have family photos?). I enjoyed folks’ stories and the fond memories they spurred. On the drive home that evening I realized my new hometown’s 150th birthday was nigh. Atlantic City had been my home for nine years, and I had immersed myself in its history. The board backed my idea, and the president told me to put a book in her hands by Thanksgiving 2017. 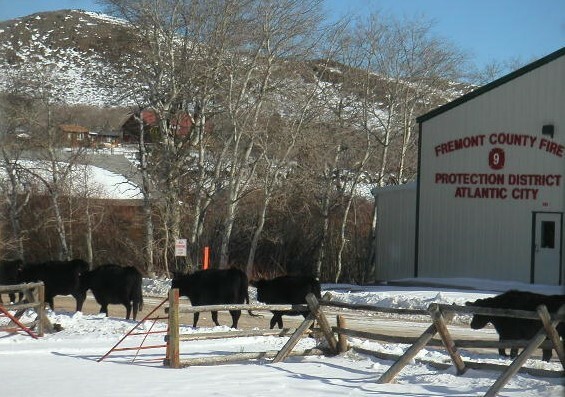 I sent a press release to the Fremont County Visitors Council. They shot gunned my invitation to storytellers – poets, songsters, artists and photographers – to 94 media outlets throughout Wyoming. Contributors’ promises trickled in. I sought contributions from everyone I knew and for them to ask everyone they knew. Folks still remind me how I stopped them in the middle of the street to ask for their story. The trickle became 2016’s spring thaw. The historical society’s rolls reckon 70-plus. 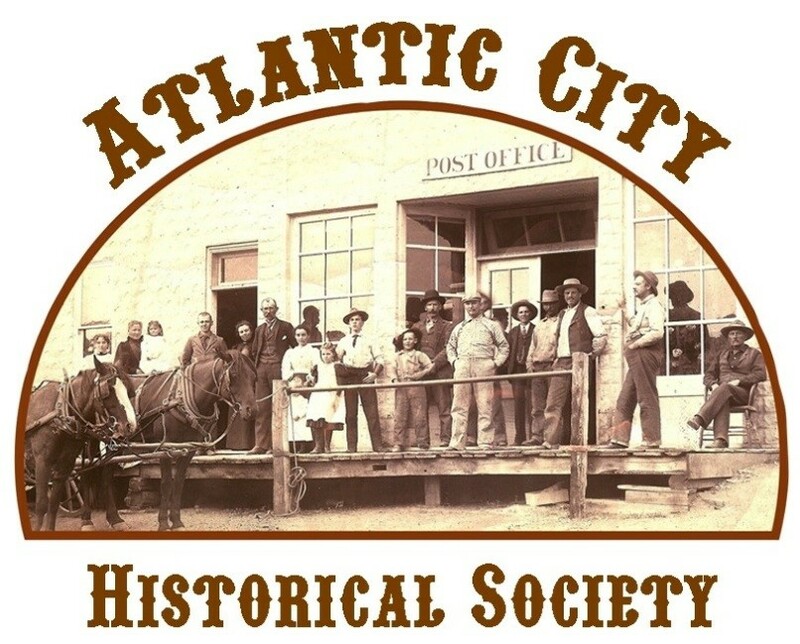 Society members meet annually the last Saturday in August to tour some historic site near Atlantic City. About 50 folks attend. Our 2016 gathering offered the opportunity to extend my call for submissions. I shared what I had in hand with the others at our October 2016 board meeting. Three members – LeAnn Woodhouse, Amy McClure and Marjane Ambler -- volunteered to form a committee to oversee our book’s publication. They wanted deadlines! I set Thanksgiving 2016 for folks to let me know they’d submit something and Valentine’s Day 2017 to submit it. Duncan Gold Mine and Mill outside of Atlantic City. Photo courtesy of Atlantic City Historical Society. The committee and I scoured the stories. We looked for holes. We weren’t trying to publish a definitive history, but we had a focus: who will want to read our book? We needed gold mining stories. A gold boom spawned the Dakota Territory town those 15 decades ago. The U.S. Army established Camp Stambaugh nearby to protect the miners and others. Soon came the bust. Other gold booms and busts followed. Pam Spencer-Hockett, the society’s president, volunteered to write those stories. An iron ore mine opened within a few miles of the city in 1960, bringing the biggest and longest lasting boom. 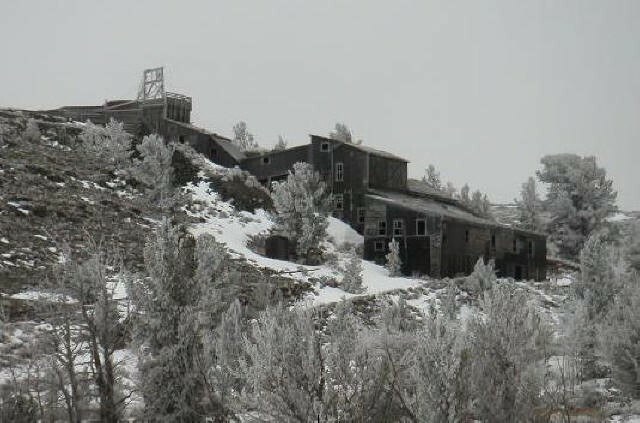 That mine busted in 1983, but its imprint remains today in the people, businesses, buildings and memories. LeAnn stepped up to tell that tale. Fincelius Burnett arrived in Atlantic City during the first gold boom. He stayed at a boarding house and grew fond of Eliza McCarthy, the woman who served his meals. Finn and Eliza married here on March 22, 1870. Finn and Eliza were U.S. Senator Alan Simpson’s great-grandparents. I invited Al to pen our introduction. John Mionczynski – jade prospector and biologist – arrived a century after Finn. He and three other musicians formed The Buffalo Chips, and John agreed to write the band’s 40-year story. Why include the story of a band? That band attracted hundreds into the fold, and many shared their view of that family’s story. Moo-rning rush hour in Atlantic City. 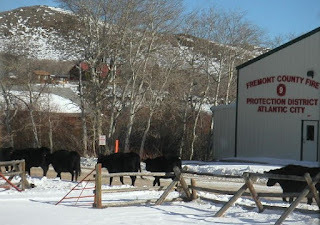 Cattle ranching grew up in the old mining district to supply inhabitants with beef. The cattle industry still plays a role in daily life from spring through fall. Cattle roam the city’s dirt streets, and cowboys frequent the local watering holes. They’re part of the family. LeAnn interviewed one of the local icons and wrote the rancher’s story. A ranch gal on the Green River is heir to two families from the early years. She compiled both families’ histories and documented cattle brands that originated in the area. A local author published her first book in 2013. She put together a book fest to launch her book and highlight seven other local writers’ books. The fest attracted 50 folks from five counties. Two and a half score sent stories, poems and a song. Scads sent photographs and other loose threads that helped us stitch together the quilt that covers the town’s 150-years. As editor of this patchwork collection I offer this. A few of our contributors are writers, but our storytellers come from all walks of life. Their passion for the city enabled them to share their heartening stories. There’s a message here: write what you know and love. From memories of school-aged children to raucous goings on at the local tavern, to a summary of contemporary businesses, to a review of who lived here and how the demographics changed with each census, to images of public records, submissions began to paint a community image none of us had envisioned. The spectrum spans humor and heartache, toil and hard work, fun and play and, yes, death. One researcher’s work documents Atlantic City burials. There are twenty marked plots, but the database now holds the names of more than 80 souls. 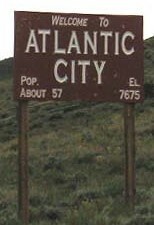 Atlantic City’s culture emerged. A contrary, self-reliant lot thrive here. They exhibit defiant independence and pride not found in places with modern conveniences. In fall 2016 Amy coined a phrase she felt described their stories: Voices from a Powerful Place. 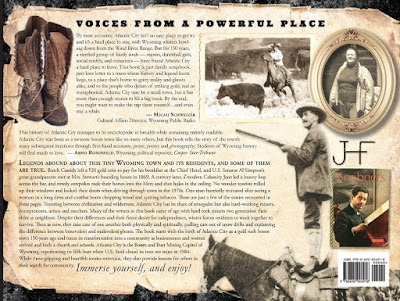 The publications committee hired Roger Carpenter, a professional graphics guru in Laramie, to design the book, and, wow, what a job Roger did! After I completed editorial work on each story – coordinating back and forth with the author – I sent the stories to LeAnn and Amy, the photo editors. They read the stories, pulled imagery – from the 2,300 images they’d scanned into a computer – to support each story and forwarded the finished work to Roger. As Roger worked his magic with imagery and text, and after completing each of the 12 sections, he forwarded proofs to us. Marjane and I scoured the pages, identified errors and sent corrections back to Roger. The committee planned for pre-sales commencing at the society’s 2017 meeting. Roger hired PBR Printing in Cheyenne to print our book. PBR sent a printer’s proof: a 280-page anthology spanning 150 years of a never-incorporated town with 30 fulltime inhabitants. Atlantic City, Wyoming, Voices from a Powerful Place was real. I cried. PBR would print 400 soft covers and 100 hardbacks and promised a November 15th delivery. 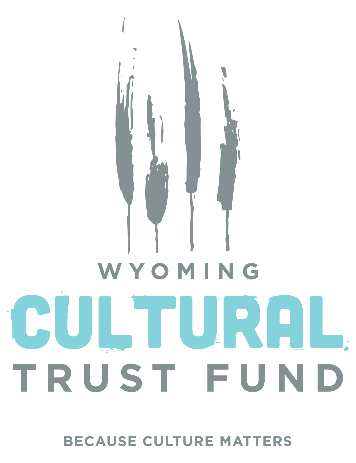 We sent a press release for a launch date of the 16th at the Fremont County Pioneer Museum in Lander. With two weeks lead time we arranged catering and spread the word via every medium. 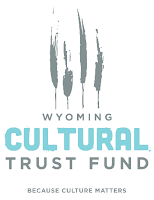 I drove to Cheyenne, picked up the thousand pounds of books and staged them at the museum on the 15th. Our launch drew 150 folks from three counties. The hardback books sold out, and so did half the soft covers. KTWO tv in Casper aired segments of our launch on its 5 and 10 o’clock news broadcasts, and the Lander Journal published our launch story on its front page. Folks from across Wyoming and beyond called with orders. Between November 17th and December 17th we sold out. We ordered another hundred hardbacks. LeAnn picked those up in Cheyenne on December 15th, and before Christmas half of those were gone. We’ll reorder more soft covers in the spring to prepare for the town’s two-day 150th anniversary celebration on July 5th and 6th, 2018. I’ve already begun traveling Wyoming to share our experience and our book. I’ll make presentations at historical society meetings, libraries, museums and more through 2018. 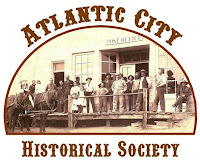 I acknowledge every member of the Atlantic City Historical Society board of directors. Each made significant contributions to our book by transcribing audio recordings, reviewing oral histories, writing stories, helping with grant applications, mailing postcards and letters and lots more. My sincere, huge thanks to each one. Beyond the other board members’ labors, two years of work – thousands of hours – by four volunteers, Roger and PBR Printing went into this. We’ve heard many a call for volume II because our book, they tell us, has re-formed bonds and connected so many from the past and present. We beam with pride, but we’ll leave that next chapter for a future generation. 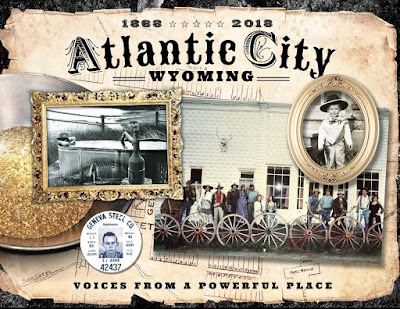 To join the Atlantic City Historical Society or to purchase the book, contact the society by mail at 15 South Dexter Ave. Atlantic City WY 82520, by phone at (307) 332-9402 (leave a message), or by email at ACWYHistoricalSociety@gmail.com. Bob Townsend, born in Thermopolis and reared in Shoshoni and Riverton, told pilots where to go from U.S. Air Force control towers and retired as a Chief Master Sergeant. 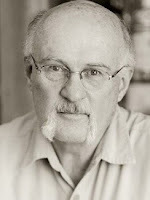 In 2005 he edited the University of Wyoming's literary and arts magazine, Owen Wister Review, and earned a B.A. in journalism with a minor in English. You’ll find Bob year-round near his cabin in the Atlantic City suburbs. He writes and edits friends’ works. He collects, and actually reads, oddball dictionaries.